The winter campaign against Finland in 1939-40 had shown up many shortcomings in the Red Army, but it was not until after the German invasion of 1941 that the Soviets introduced a new field gun, the 76.2 mm Model 1942, later known as the 76-42 or the ZiS-3. This boasted several improvements on its predecessor, the most notable being that it was lighter, cheaper and easier to mass produce. It could stop all but the later heavy German tanks, was easy to use, robust and therefore extremely popular with its crews. In all over 100,000 were made - the most numerous field gun of World War II, and considered by many to be unsurpassed by any gun of any nation at the time. Many now survive as memorials in modern Russia, but many others went on to serve in the armies of the USSR’s friends and allies, notably in Korea and Indo-China, and many are thought to be still in service today in places like Africa. 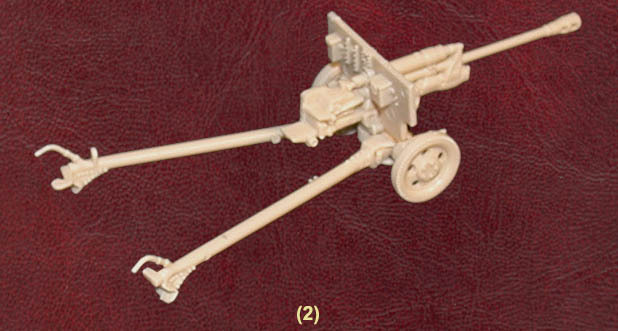 While this is not the first plastic model of this excellent gun to be made in 1/72 scale, Italeri have had the intelligence to include a good selection of crew figures so the model can be shown in action. The figures are what might be expected - mostly bringing up or handling ammunition, with a nice officer pose (pointing, as most officers seem to do in this hobby). The man handling the weapon has been given no base because he is next to the gun, but we would have preferred a cut-down base as while he does stay upright by himself he is not very stable. However we liked all the poses. All the figures are clearly dressed for the cold, with three having greatcoats and the rest wearing the telogreika quilted jacket. One man is also wearing quilted trousers (which were less common and not as popular) and all seem to be wearing the normal boots. Three have the standard M1940 steel helmet while the rest have the very recognisable ushanka cap. A couple of the men have rifle ammunition pouches on their belts, although these are pushed round to the sides (more understandable for gunners than riflemen), and the officer seems to have pushed his pistol holster out of the way to the middle of his back, which would be a difficult place to reach in an emergency. However everything here is accurate and a reasonable representation of the subject. The sculpting of the figures is really good with all the detail these relatively simple uniforms require. The lower legs of the kneeling figure in the second row seem a little odd to us, but frankly that is a detail that is almost invisible and does not detract from the look of the figure. Flash is at an absolute minimum, and while there is some extra plastic (such as where shells are being held), this is not at all serious. The gun too is a very nice model. It is made up of just eight pieces, which means some small parts are missing - most notably the sight - but it has managed to retain the right overall look, so only a detailed examination would reveal the missing parts. The kit goes together really easily too, with the split pole trails being hinged and not glued, allowing them to be moved as desired (although the rest of the model should be glued). This is another top class product from Italeri, and is clearly meant to complement their winter infantry set. Happily it avoids the poor pose choices made in that set and is therefore a superior product yet matches the infantry perfectly. With just 12 figures and 2 guns it falls well short of filling the large box but the price reflects that and this product should prove popular both with those interested in World War II and those with an interest in many post 1945 conflicts.